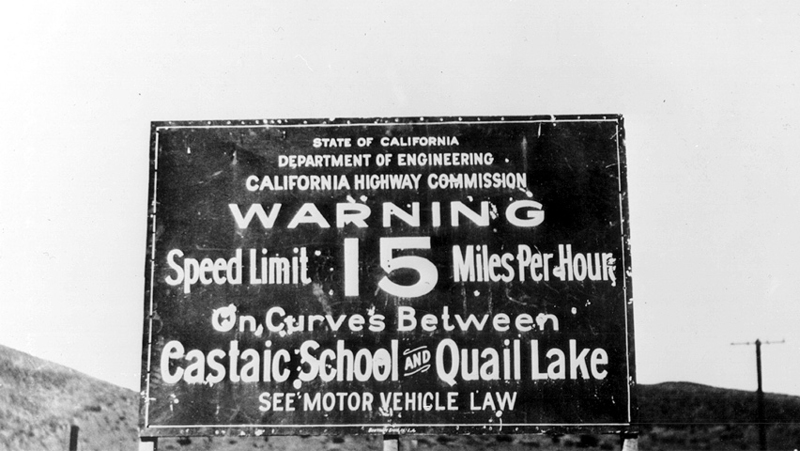 Warning sign, south end of the Ridge Route, Castaic, 1920s. "Due to the elevation and circuitous nature of the new highway, the speed limit was set at 15 miles per hour. The speed limit for heavier trucks with solid rubber tires was 12 miles per hour." "The Sheriff said: Woe to the man, woman or unlicensed child who tries to speed where there is to be no speeding — none at all, whatsoever ... I don't want to be killed myself up there and I'm not going to let anyone else take the chance." "Before the road was thrown open, the Automobile Club of Southern California was given only 24 hours' notice to post signs along the nwe highway. ... The Automobile Club erected approximately 150 metal road signs [by late October 1919]. People complained that there were more signs than trees. Ultimately some of the signs were removed and warning signs were erected at both the northern and southern terminals of the Ridge Route." "All of those warning signs were a testament to the 'never ending' twists and turns of the old road. ... In the 36 miles between Castaic and Gorman the road had 697 curves, which equalied 97 [complete] circles."